It’s good to be wiked. Even with all this wonderfulness, I did not feel entirely at ease. I had crazy dreams every night, on the order of this: I am a student in a class on a subject I cannot identify. The teacher explains the major project of the course, and I understand none of it. I can’t even figure out which handouts I’m supposed to take. When Husband and I went away for a few days this summer on our own, I felt 100% relieved of anxiety and sadness. From this difference, I deduce that if my kids are with me, responsibility is with me. There might be plenty of fun and pleasure, but it is not a vacation from work. Kids need to get dressed, eat, be supervised, be coached through tantrums, put to bed. Sometimes this seems entirely logical: I am a stay-at-home mom, and I need time off from the job of “mom”. Sometimes it makes me feel like a jerk: how can I not love to be with my funny, adorable, smart children? My feelings do not respond readily to logic. I recently finished reading The Preservationist by David Maine. It is a novel based on the account of Noah in the book of Genesis. Maine imagines what Noah and his family might have thought and felt, how exactly they might have accomplished what God instructed. I went back to Genesis and realized, for the first time, that we are told primarily about what God instructs Noah to do, and then that “Noah did everything just as God commanded him” (Genesis 6:22). That’s quite a gap in the story. Maine’s novel caused me to consider the ways we respond to God. In Maine’s story, Noah, his wife, his sons, and his daughters-in-law each interpret God’s intentions pretty differently. Each is persuaded that obedience is necessary, and none doubts that “Yahweh” is omnipotent. They do not, however, all believe that God is good, or that He intends good things for them. Noah is the only one among them who hears directly from God. The rest rely on Noah’s relaying of God’s commands and promises. After the flood, Maine’s Noah stops hearing directly from God and he feels lonely, possibly abandoned. It makes me wonder about the way I interpret and respond to God. How do I ride the waves between feeling close to God and feeling distant? Certainly there is no change in Him, but how I feel creates a lot of change in me. Lately, the influence of my feelings has been more pronounced than usual. Depression makes everything seem distant, disconnected from me. 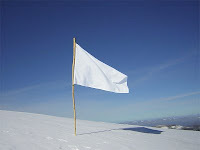 When I am very low, and most need the reassurance of faith in God, it seems the most difficult to grasp. I am reduced to the most basic sense of trust that God is true and faithful, no embellishments. We’re on a family vacation this week, and today is great. Starting vacation is a lot of work with three small children – packing, traveling, adjusting to a new place. Today we woke up content and pretty well-rested. This is just what we all need. One of the best things about vacation is the chance to attend church together. We visited a small church yesterday and had a wonderful morning. The congregation was so warm and hospitable, and the service both familiar and new in good ways. It is reassuring to have an entirely positive experience on a Sunday morning. Had a counseling appt. this week and was moaning about my life as usual: I'm so sad, I'm so tired, when will this end, blah, blah, blah. Therapist observed that I was not talking much about church, and seem to have let it fade into the background of my life as a persistent-but-not-urgent irritation. "That's a major cognitive success!" she proclaimed. If only I shared such enthusiasm. It doesn't feel like much, but I suppose it is a good sign. Once it was pointed out, I realized that I have written much less about the church lately, and focused mostly on my life apart from that. It helps me a lot that Husband has gotten much better at balancing his interests and gifts in ministry with the requirements of the sr. pastor. Husband is able to enjoy and appreciate the opportunities God provides for him to care pastorally for individual people. It has never been so clear that the ability to celebrate things that are going well is a gift from God. I feel like there are a thousand things I would like to write about here. Trying to write with enough clarity that someone else can understand how I feel is very helpful to me. It helps me complete thoughts and understand myself better. But today I feel too spent to think. I'm feeling anxious about several different things, including vague possibilities that are arising about where God might call Husband to serve next. I want to be open to God's plan for us, but feel too tired to consider new possibilities. I'd rather take a nap and someone can wake me up when it's time to move on. I tend toward thoughtfulness under normal circumstances. I like to think about the world in the abstract. Why do people behave the way they do? What influences us? What shapes our attitudes and expectations? This week I took it as a sign of well-being that I was able to read an essay on the plasticity of the human body in postmodern culture. Sometimes, however, this pattern of abstracted thoughtfulness is annoying. It can be hard for me to feel when I am preoccupied with analysis. The thoughtfulness that attends my current mental and emotional state is something different. It is profoundly self-centered and much more difficult to escape. This thoughtfulness is not detached from feeling, but actually produces very intense feelings. I can think about myself and swirl around in my moroseness for a long time. I have, by long habit, become accustomed to attending closely to what other people need. Parenting three children affirms that habit, since they require me to put their needs above mine several hours a day. Being a woman, a pastor’s wife, a person who likes to think herself independent and compassionate: these all reinforce possibly excessive other-centeredness. It is shameful to me that I have swung the other direction entirely. Right now, sustaining attention to someone else’s needs is exhausting. Maybe the burden is not thoughtfulness so much as self-centeredness. 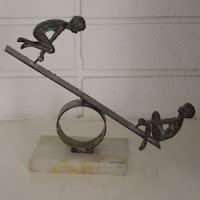 It’s like I’m on a teeter-totter and want to get to the balanced spot where I have the humility to recognize both my needs and other’s needs, but so far I’ve been all teeter or all totter. 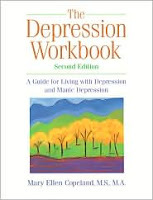 Early this summer I got The Depression Workbook by Mary Ellen Copeland. It seemed way too hard-core for me. Copeland talks about charting moods, making hour-by-hour plans for the day to provide structure, and making plans to deal with variously severe stages of depression. Sure, I was depressed, but really? I could get through the day without a diagram, thanks very much. A few months have passed, and Copeland's book seems much more relevant. A written schedule for the day sounds pretty nice. I've started trying to think about what triggers a deeper depressive phase for me, and how to stop the slide before I'm at the bottom of the hill. I keep hoping that going to church will stop being a problem, but this morning I decided that attending worship at our church qualifies as a "trigger" of a depressive mood. I felt calm and well-organized about going this morning, but by the middle of the service was a little dizzy. Nothing unpleasant happened; there just seems to be so much accumulated anxiety about the place that peace and happiness are not there for me. This week has been better, and I'm pretty sure it's because I've finally taken Therapist's advice about child care. For months Therapist has been telling me it would be wise to have someone else take care of my kids (two) or THREE mornings a week. I was hesitant, then in a phase of desperation finally called a friend for help. She came over twice a week for a long time. She is such a kind friend. My friend can't do that anymore, and I lined up one day/week of help. And that has not been enough. Therapist adjusted the recommendation to (three) to FIVE days a week. I give in! This week, there was only one day when I had no time off. The decreased strain on my energy is magical. I am not comfortable with this. I feel like a slacker. I try to frame this as Mom Disability Leave. I was not annoyed when Husband needed to go on leave from his work. Just because there's no official process for moms to do the same does not preclude us from illness. It's ok to need help for a while. I’ve mentioned Rev. Todd Peperkorn’s book, I Trust When Dark My Road in an earlier post. It was a fascinating read for me. I was intrigued that the book really seems to be intended for pastors who are going through depression. I would not have imagined there was such a large population of clergy in this situation. A July issue of New York Times Magazine included an essay called “The Other 0.1%: Parents’ worst fears almost never materialize” by Matt Bai. He described a freak accident that involved his three-year-old being nearly strangled by a seatbelt. Bai’s point was that crazy, dangerous things happen, but it does not help to live in fear or try to anticipate all of them. For a while I coped with this horrid situation by assuming it is part of the 0.1%; that this does not happen to many people and would not possibly happen to us again. It seems I assumed incorrectly. Many of the people who read this blog have similar stories of church-induced (or at least church-related) misery. I suppose I have been naïve. There’s nothing to be gained by fearing future episodes of debilitating illness or cannibalistic church situations. I like to think that my optimism will eventually return, but it will be of a more sophisticated, vigilant variety. I had no idea there was such a thing as National Invisible Chronic Illness Awareness Week. I’ve never even heard of the concept of invisible illness, but that certainly captures something important. Looking normal and feeling crummy can be isolating. I’m still struggling, but it IS nice to have a day when I am able to pull myself together and make it out of the house! Good, because if I looked like I feel it would scare you to death. Thanks, I’m grateful for this good day. Praise God, I’m glad that he enables me to look so much better than I feel. Thanks, that’s God’s joy shining through! This is a hard one for me, especially at church. I am reserved in most settings and even more so as “the pastor’s wife.” Somewhere I got the idea that the pw should be perky and sweet on Sunday mornings. I’m seriously reconsidering that, but it’s a hard habit to break. Depression seriously inhibits planning capacity. After the kids go to bed at night, I try to think about the upcoming day. I am completely overwhelmed if I try to imagine the entire 24 hours ahead. I can’t even work out the morning on my own. Husband has to sit with me and talk me through a plan for the morning and assure me it will work. In the morning, I often feel fine for a couple of hours and then things start to wander. This is where the plan kicks in – without it, I would be paralyzed with indecision and lack of motivation. As far as I can tell, this is related to the short-circuiting in my brain. I am not able to anticipate anything being pleasurable. There are plenty of things that feel vaguely pleasant once I am doing them (going for a walk, for example), but I don’t feel any confidence or pleasurable anticipation. It’s a weird, gray way to live. Biological - People with depression typically have too little or too much of certain brain chemicals, called "neurotransmitters." Changes in these brain chemicals may cause or contribute to clinical depression. Gender - Women experience clinical depression at a rate that is nearly twice that of men. While the reasons for this are still unclear, they may include the hormonal changes women go through during menstruation, pregnancy, childbirth and menopause. Other reasons may include the stress caused by the multiple responsibilities that women have. Co-occurrence - Clinical depression is more likely to occur along with certain illnesses, such as heart disease, cancer, Parkinson's disease, diabetes, Alzheimer's disease and hormonal disorders. Reasons 1, 2, and 6 are the ones I was familiar with before now. Those reasons don't seem to have caused my depression. In my simplistic logic, this meant I could not be really depressed, just, you know, sort of depressed. For a little while. But it would go away quickly. Looking through the list, the two definable factors that apply to me are being a woman and living in a difficult situation. The best assessment I can come up with to describe how I wound up in such rough shape is a particular, tragic confluence of a difficult situation at church, social isolation (of having recently moved), and my tendency to try too hard for too long to handle hard things on my own. I can't decide if it would be better for me to stop trying so hard to figure out the why of this. This week I am bordering on incapable of doing the minimum necessary for myself and my family. In a quiet moment, when I try to describe this to my husband, he speaks to me with love, sympathy, and kindness. How am I so lucky to get this guy? Some of my closest friends are people I was drawn to because of their ability to maintain a positive attitude. I try to cultivate optimism in myself, and approach challenges with a willingness to adapt as much as possible, to make the best of any situation. I attribute much of our happiness through five moves to a good attitude. It appears that there is no role for positive attitude when dealing with depression. Trying to sustain one has filled my bucket with a fair measure of frustration and guilt. The strategies that have usually worked in the past do not work right now. When I was well, but feeling blue, there were predictable ways to improve my mood: talk to a friend, do something fun, accomplish something on my to-do list. Now, any one of those things might distract me, but the underlying sadness and fatigue lies in wait until my attention is available again. For the last week or so, I have taken pains to make plans in advance for every day. Waking up in the morning with no plans makes twelve hours with three children overwhelming. Today we spent the whole morning with friends and everyone had a good time. Then, while driving home, the sadness and fatigue were uncovered and there was nothing to mask it. It is hard for me to grasp that the persistence of this weight is not because of some failing on my part. I feel like I must be doing something wrong or this would go away. I know the facts of depression – it is an illness, it alters brain chemicals, I cannot will it away – but it is hard to accept that all this applies to me. If this describes me, then I have little to do but surrender, cope, and wait. Things are better today. As my husband and I have come to describe it to each other, I’ve stepped back from the edge of the cliff. One thing that helped was going away for the weekend. I took my kids to visit my brother and sister-in-law who live in a nearby city. There are lots of reasons that trip helped: being was away from home, being with people who recognize my sadness and are willing to live alongside it, sharing the responsibility of caring for my kids, being with people who are not depressed. For a couple of days, the pressing weight was lifted enough that I could breathe. I recently read Rev. Todd Peperkorn’s helpful little book I Trust When Dark My Road: A Lutheran View of Depression. He emphasized the necessity of time and space to think and rest when coping with depression. Acknowledging that seems to have been a big step for him. This is a struggle for me. I feel like I’m cheating, or admitting defeat, if I need extended time away from home or from my kids. I know this is crazy. I know there is a limit to how much responsibility and stress a person can deal with before being overwhelmed, but I cannot figure out how to judge what that limit is for me. Or how, perhaps, the limit is different right now than it was two years ago. If I cannot do all that I used to do, am I less than I used to be? Sometimes I like to think of therapy as private lessons in life. It seems more forward-focused and proactive than the reality: I go to therapy because of pain. I am resentful of being depressed and needing help. I feel like the church has done it to me, and I am sporadically disappointed in myself for not being able to muscle through. I am self-conscious about the lessons; it’s like talking to a mirror. It is by turns reassuring and disturbing to find out that this person who is outside my head sees the world the way I do. Other times, my own thoughts and feelings are interpreted and reflected back to me in startling, painful ways. Sometimes I have been so overwhelmingly sad that I want to take a blanket along to hide under and just sit in the corner and cry. Before this year that would have sounded stupid to me. What use would it possibly be to sit in a room with someone else and cry? But then I found out what it’s like to hurt so much, and not even know what to say about it, and having a sympathetic witness seemed like it would be as helpful as anything else. Now I don’t cry so much as I laugh uncertainly and fidget. Ring-twisting, leg bouncing. For some reason, I look forward to these lessons. I usually leave feeling worse than I did going in, and I am usually tearful and thoughtful for a few days afterward. I suppose my heart understands that this unpleasant process is how I learn.